I truly believe in the benefits of group training not only does it boost motivation to get you out there, you will generally push that extra bit further. To many times, especially now that it’s getting colder the alarm goes off we hit the snooze button a few times and then finally roll over and go back to sleep knowing that if nothing has been organised (weather with a couple of mates or a training group) no one will be waiting for you to go training, no harm, no foul. If you know some one else is going to be there we’re out of bed not wanting to let our training buddies down, hence the boost in motivation. Funny how it’s fine to let ourselves down, but not our mates. Agreed group training may not be for everybody and there is certain mental aspects of group sessions that should be given some thought before undertaking a lot of group training. Group training will help you to push the limits as far as you are willing to take it. Using group training for a purpose has to be at the forefront of your motivation i.e. working on speed, endurance, power, etc. not going out just to smash your mates. Pushing yourself out of your comfort zone is the only way to improve performance, but in saying that pushing the body to the extreme can lead to a break down in form so having the self awareness of technique whilst under pressure is imperative. Group training brings people of varying abilities together. Different levels of fitness, different phases in training, rookies to the more experienced athlete so having a target on some ones back is great to use as a benchmark it shouldn’t be the be all or end all, remember what the ‘purpose’ of the session is. Keep the big picture in mind being faster than the next person in training means nothing if you fail to achieve your ultimate goal. 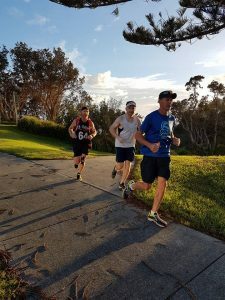 Not only being a lot more enjoyable than going through the motions on your own sessions the social aspect and sense of community is an immensely satisfying feeling and if your crazy like a lot of us triathletes are pushing yourself and your mates to breaking point and being able to laugh about it afterwards is also another rewarding feeling of comradery and achievement. You’ll be amazed at how far you can go with the support and encouragement of your fellow training buddies. So in conclusion use group training for the right reasons, have fun whilst training with friends and be respectful of every one out there giving it a crack. Enjoy life friends, Coach Ben.